The Anja Round Dining Table is part of the Eco-Natura Collection, which is offered exclusively by Inmod. Conceived by award-winning Italian designer Lino Codato, the Anja is a truly unique blend of responsible construction, Scandinavian-inspired style and extreme household durability. Looking past the clean angles and curves that define its striking beauty and modern look, the Anja is both eco-friendly and environment-safe; the base is constructed of FSC-certified solid ash wood legs, and it's top is a scratch, stain and burn-resistant engineered wood, finished in a sleek white powder coating, which is treated to eliminate bacteria and toxins. Delivery was pretty quick and easy. We were super impressed with how well it was packaged and labeled. The table itself: AMAZING. So much to love. The lines of the table legs are so unique and the fact they are eco friendly wood is a huge bonus. The powder coated top is exactly what I needed with two young kids. This piece is perfection in our breakfast nook and I know will get years and years of good love & use from us. Exactly as presented & more! First, we got a great sale price earlier in the year for $692 & free shipping! It's worth more, though. The top is just what we wanted in color & durability. And the leg design is perfect in a contemporary home. We can seat 6 comfortably. There are so many seating designs this table can accommodate. We found this piece after searching for over a year. ProsDelivery was timely & no damage. Slowly swapping all my old furniture for eco-friendlier versions, i've been finding eco-friendly and environmentally safe furniture has even better features than some of the more generic stuff out there - for example, this table is heat-cured and resistant from stains, scratches and burns - aside from the other tables in this collection, these are the only ones i've seen with these features. I love it so far, the color and style works great in my kitchen and I have a feeling it's going to last a long time, thank you! Probably the best purchase I made this year so far!! Firstly, the style is great - looks just like the photos and goes beautifully in my kitchen! Secondly, it is very strongly made and well crafted - Thirdly, although I have yet to test it's resistance to straining, scratching or burning - i have a good feeling it will live up to its features!! Thanks!! 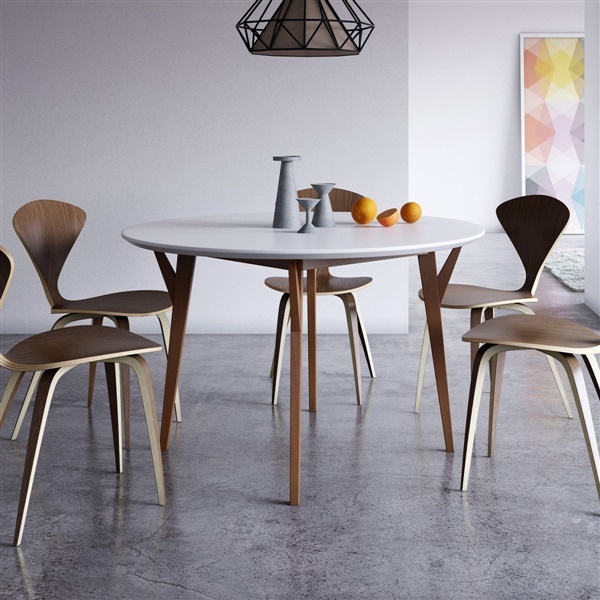 love the tree branch inspired design where the top of the legs meet the table top, so chic! I really couldn't ask for more! 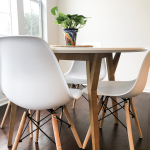 I love the design and it fits well in my kitchen, plus it is environmentally safe and it is scratch, stain and burn resistant, which is a HUGE bonus considering i have two boys at home, thanks! good for the environment and long-lasting! thank you! eco-friendly, durable, sophisticated design, elegant! sooo thrilled with my new dining table! The Eco Natura Anja Dining Table can comfortably seat 4 chairs, with all chairs being able to be pushed in. 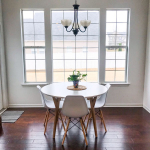 Where is this table made? The Eco Natura Anja Round Dining Table is manufactured in China. 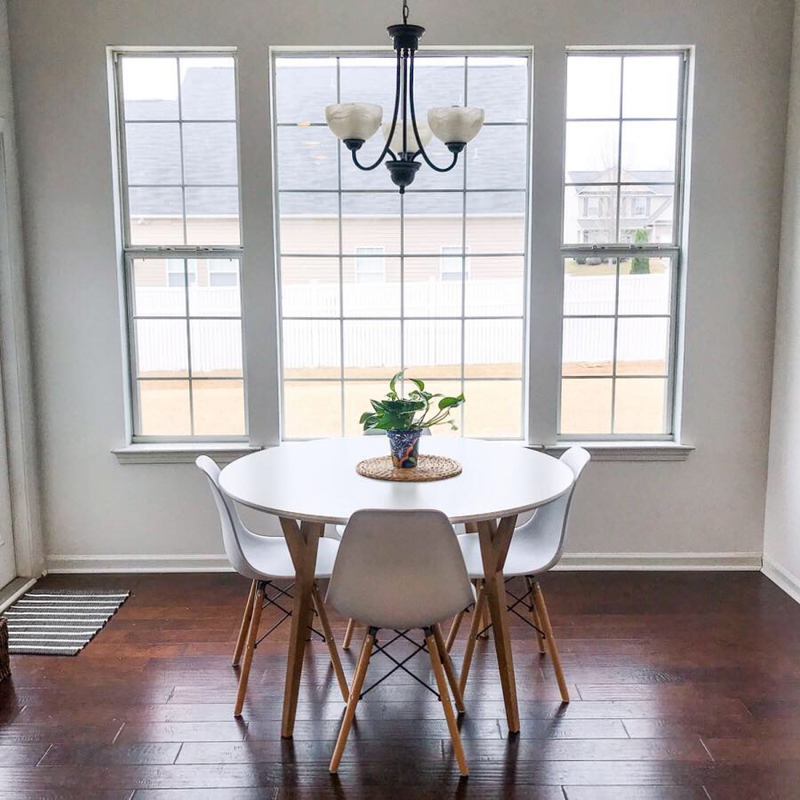 Hello, I am interested in this dining table and was wondering what chairs are recommended to pair with it. I was considering the molded plastic with either the natural/oak or walnut dowel legs but I'm not sure. Because the wood on the legs is ash I'm not sure what chairs would look the best. Please give me a few chair options that you think would look great. I would greatly appreciate it. Below are some links to a few chair options that would pair nicely with the Eco-Natura Anja Round Dining Table. http://www.inmod.com/norman-bentwood-chair.html http://www.inmod.com/molded-plastic-eiffel-side-chair-white.html http://www.inmod.com/hans-wegner-ch24-wishbone-chair.html For the Molded Plastic Side Chairs with Wood Legs, the wood finish of the natural legs is lighter than the table legs, and the walnut finish is going to be darker than the table legs. Can you send me details on the VOCs for this product? The Eco-Natura Anja Round Dining Table is VOC-free.